Figuring out how to make extra money is not an easy path. But I'm here to help you smooth out that path and achieve your goals in the fastest way possible. You're probably want to make extra money because you have a financial goal that you want to achieve, like buying a home, retiring from a traditional job, and saving for a wedding come to mind. If you want to reach your goals you can either save more money or make more money. One of those options is limited. You can only save so much. And you can't save what you don't earn. In order to maximize your efforts, you'll have to find a way to make more money. I'm here to help you earn more by turning a skill you already have into a viable side hustle. Many of the links below are partner links, meaning if you click and decide to make a purchase, I may earn a small fee. That does not change the price you pay and I only recommend services I know and trust. Thank you for choosing to support in this way. Affiliate marketing is when you recommend other people's products and services and earn a commission. Unlike multi-level marketing where you have to purchase the product and pay each month to remain active; with affiliate marketing you don't have to pay anything up front (or ever). There are many courses on affiliate marketing. But the best one that I have taken myself is the one from Michelle Schroeder from Making Sense of Cents. The Making Sense of Affiliate Marketing Course (Also includes a Pinterest Strategy Guide). If you are already familiar with affiliate marketing and you have a blog, maybe you just need more traffic. In that case, you should check out this Pinterest Strategy Guide. And if you'd like to see how to grow your traffic from search engines beyond just using Pinterest, then check out the Traffic Transformation course. Also, if you are not in a place to invest in these guides or courses, you can always start with this free Blog Traffic Guide. After I had been blogging for a few years, I learned that I could earn more if I created my own product. I created a toolkit and started getting payment notifications on my phone at random times. If you'd like to create your own product, then you should start here with my mini course. It's called Your First $500 and it costs less than the price of a Chipotle bowl. 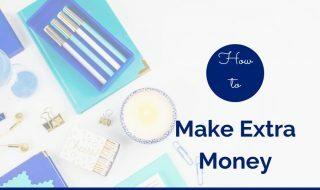 I hope these resources help you earn extra money! I will continue to add new resources as I find them, or courses as I create them.